Status: Contest finished on 12-12-2009. New remix contest by Iamon.it. They are running two separate contests for vocalists and producers. So enter it and get the stems! The On.It remix competition is now open. 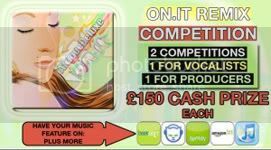 We are running 2 separate competitions for vocalists and producers. Genre is not a boundary. Be as creative as you feel!! Just keep to the theme of On.It. To enter simply vocal the instrumental or remix the acappella and upload it to your myspace/facebook/youtube or anywhere online where your mix will be audible. Send us the link to your uploaded submission via the contact form below. On closing entries will be judged by our team at which point 3 vocal entries and 3 production entries will be selected for public voting. Voting will commence from 00.00(GMT) on the 14th December and will close 23.59(GMT) on the 20th, at which point winning entries will be decided by the votes. Winning remixers will then be requested to submit their acapellas or instrumentals for mixing and will be provided with relevant paperwork.